I highly recommend QR Codes for any printed advertising you do for your wreath business and especially for craft fairs where you sell. I am sure you have heard of QR codes by now, but if you haven’t, they are basically like barcodes you see on grocery store items. However, the difference between the two is the amount of information QR Codes can store and share. When you scan a QR code with your Smartphone, the image will kick back information from the QR code. What information you ask? Countless amounts of information and you choose what you want to share. The information held in a QR Code, the ease of use, and cost (free) makes them practical for any print used for a small business. In order to read a QR code, you must install a free QR code reader on your smartphone. Just go to your app store and search QR Code Reader, there are many to choose from. However, choose an app that allows you to also create QR Codes not just read them. So how can you use a QR Code to promote your wreath making business? Print out a sign and display it at your craft fair in a pretty picture frame or even in an inexpensive acrylic frame. This will allow your foot traffic to take a digital business card with them. Build Social Media Followers –Create QR Codes to generate Facebook Follows, Pinterest Followers or Instagram Followers. You create the QR Code so that when it is scanned, it automatically links to your social media pages so your fans can follow you. Capture emails –This is one of the most important in my book. Generate a QR Code from your email service provider (such as mailchimp.com) so that when a customer scans it they complete the form to be added to your email list. Later you can email your customers a newsletter, new products created or exclusive discounts, etc. 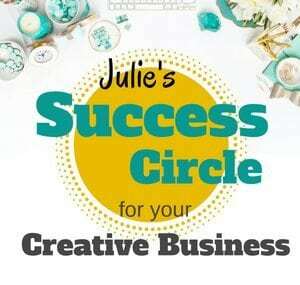 This is a great way to stay in touch with your potential customers months after the craft fair is over. Generate a code that includes all of your contact information so that when a customer scans your QR CODE your contact info can go straight to the phone’s address book. Link to a blog or a blog post –If you have a popular blog post you feel your customers will benefit from while shopping at the craft show, have them link to it through a QR Code. 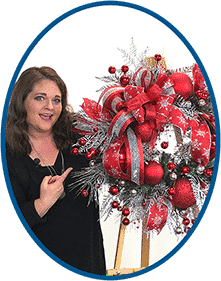 For example, If I sell a wreath I may want to give customer information on how to care for their new wreath, how to store it, how to fluff it once out of the box, etc. So I can have them scan a QR Code instead of printing all the information on paper or better yet, link to a Youtube video of you demonstrating the procedures. 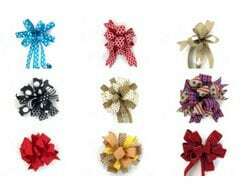 Offer Coupon Codes –Let’s say I offer a discount for the day for just those customers at the craft fair but they are not ready to commit to purchasing from me or they left their wallets at home. I can offer a QR Code with the daily discount code where they can enter it in my Etsy shop or website at a later time. Your buyers will really appreciate your patience with their decision making time. Display on your car in the form of a magnet –Who has time to find a pen and paper when driving. If you display your business name and website already on your car, consider adding a large QR Code. Add to Printed Material – Add a QR Code to business cards, brochures, marketing materials, price tags, etc. Here is an example of how I use QR Codes on the BACK of my business card. Share Your Location – Use a geographic QR Code generator to create QR Codes with your embedded co-ordinates. The geographic co-ordinates are stored and when scanned will redirect to a static mobile Google map of your location. A great way to have your foot traffic share the word on Twitter or Instagram for those already in the area to find you. Just enter in an address or place a marker on the map, click the ‘Create Map QR Code’ button to generate the geographic QR Code. This isn’t available with all QR Code generating apps so you will need to make sure you pic an app that offers this. This is very GREEN – In a society that is overrun with excessiveness, this is refreshing to offer something green to your customers and save a tree. These are just 10 Ways to Use QR Codes for Craft Fairs but the possibilities are endless. How would you or do you use your QR Codes now? If you don’t have a QR Code yet, just start out small with your web addresses or Etsy shop address and build it up as you are more comfortable. It is FREE you have nothing to loose. If you don’t have a smartphone but you want to create a QR code, I used this free QR Code Generator to change my logo into a nifty QR Code. where do you order your poly burlap from and how much does it cost per roll? 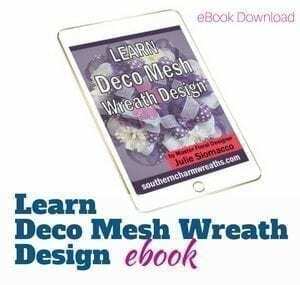 I have purchased your Learn Deco Mesh Wreath Design e-book and am on your forum. I saw you used the poly burlap, green and natural colored in one of your recent wreaths. The poly burlap I purchased from Hobby Lobby is very stiff and hard to work with. I’ve seen some at Sam’s Club but not tried it yet. I also purchase from Carolina Pottery here locally. Did you check the vendor list of the ebook? There is over 100 vendors listed in the forum. I just read an article about never being to old to try something new and make a success of it. I was something I needed. Then you, Julie, post this QR code info and I think I am too old. I have the app on my smart phone but have never used it. Is there a utube video that teaches how to do all of the above. Or would you give a class on it? LOL. Any help you can give I would appreciate it. I am going to do a show the beginning of August.